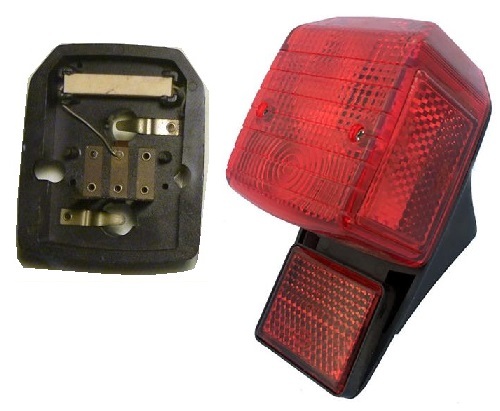 Tail lights: 1970’s and 1980’s USA moped models generally have different tail lights than European models. That is because of the 1972 and 1976 US DOT motor vehicle safety requirements for motor-driven cycles and motorized bicycles. 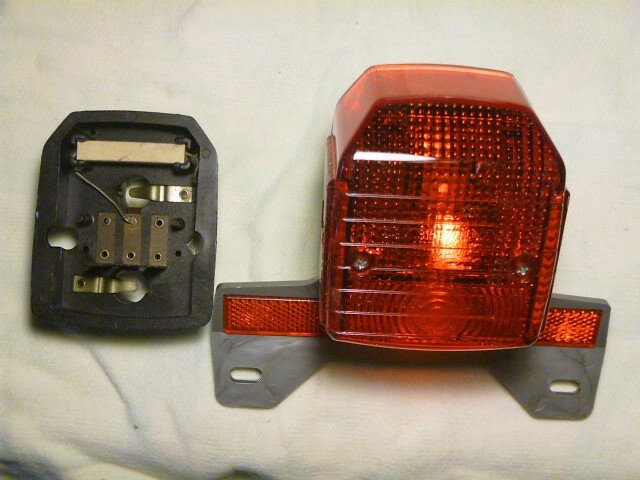 The rear light must shine to the rear and the sides, and illuminate the license plate. The rear of the bike must have red side and rear reflectors. Putting the reflectors with the tail light eliminates the need for adding them on elsewhere. Also the bulbs are bigger, 15 not 9mm, because of higher watts required for the running light, 5 watts instead of 3, and for the brake light 10 watts instead of nothing. 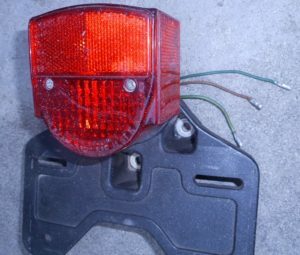 The most troublesome US DOT requirement was that the brake light operation cannot cause the head light to get dimmer. 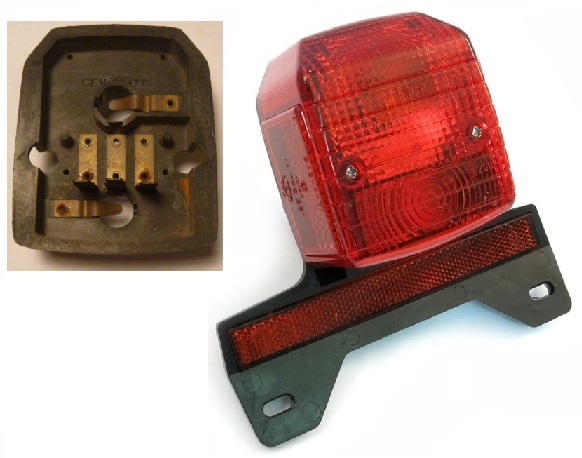 This meant that the brake light had to be powered by a separate source coil in the magneto-generator. 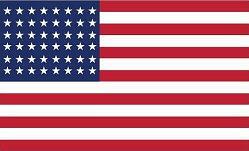 There was no solid-state voltage regulation until the mid-1980’s. The AC voltage was crudely regulated by generator magnetism, rather than a external mechanical or electronic device. 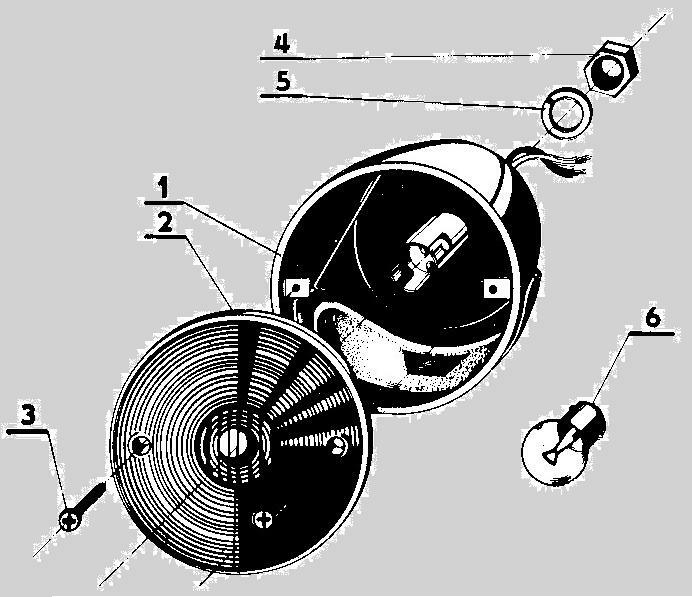 Internal ignition ground family: Some US moped versions had an additional source coil to operate the brake light, such as Puch or Batavus (Bosch magnetos). On these the brake light wires never cause the engine to not run. The ignition source coil is grounded internally, inside the generator. So the ignition is never affected by any of the lights. 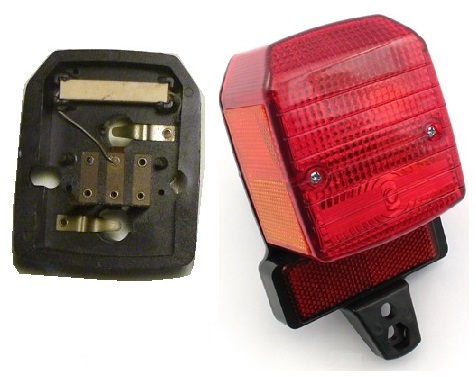 The brake light only needs to be matched with the generator source coil, usually 6 volt 10 watt. Unlike your house, a higher wattage bulb makes less light. If a 6V 18W bulb is used, it will be dim. If a 6V 5W bulb is used, it will be too bright and burn out. External ignition ground family: Some US mopeds use the ignition source coil to operate the brake light, such as Garelli or Minarelli with (CEV magnetos). On these the brake light wires can cause the engine to loose spark and not run. 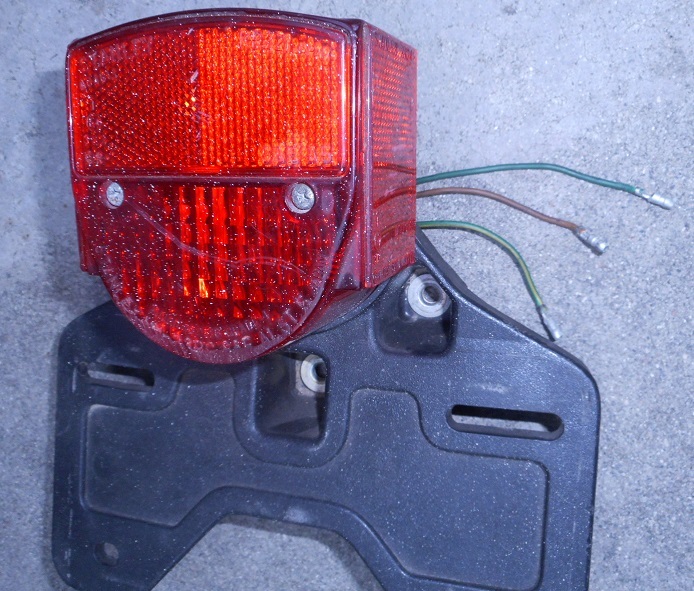 If the connecters or wires are corroded or loose, on the brake light wires, the engine will stall when the brakes are applied. If the brake switch wires up at the handlebars are also loose, then the engine will not ever “have spark”. Removing the tail light assembly, or changing it, can cause these bikes to not run. The brake light needs a 4 ohm (10 watt max) resistor in parallel with a 6 volt 10 watt bulb #81, or just a 6 volt 18 watt bulb #1129, or a 6V 21/5W #1154 dual filament bulb. Modern family: After the 1980’s, thankfully, there were no more mopeds with external ignition grounds. They had internal ignition grounds. So the brake light wires never cause the engine to loose spark. Their solid state AC voltage regulators allowed all the lights to run off of the same generator wire, yet still stay the same brightness as additional lights (brake) were turned off or on. The modern family also uses 12 volt bulbs instead of 6 volt. The brake light bulb does not need to be any particular wattage. Just like in your house, a higher wattage bulb would produce more light. You want the brake light to be brighter than the tail light, for safety, but it doesn’t need to be. Price List: Prices are for each item. Bright green means new. Dark green means used. N/A means not available. Screws: M means metric machine screw M3, M4, M5, M6. ST means self tapping screw (for plastic). 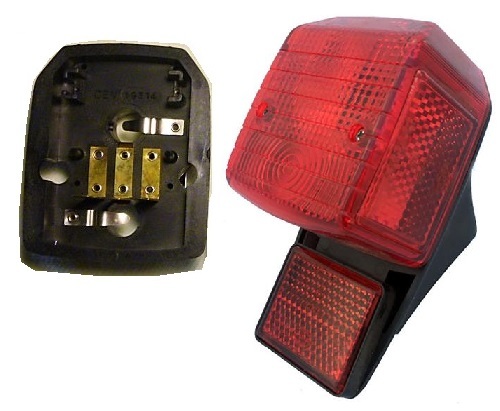 Many or most 1970’s European made mopeds, USA models, use CEV tail lights, made in Italy. 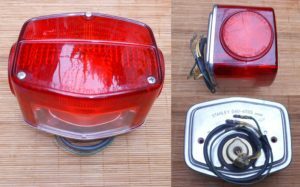 CEV 9350: Many 1972 -1976 US mopeds had this “oval with flat sides” single bulb lamp. It was exclusively on mopeds with an external ignition ground. 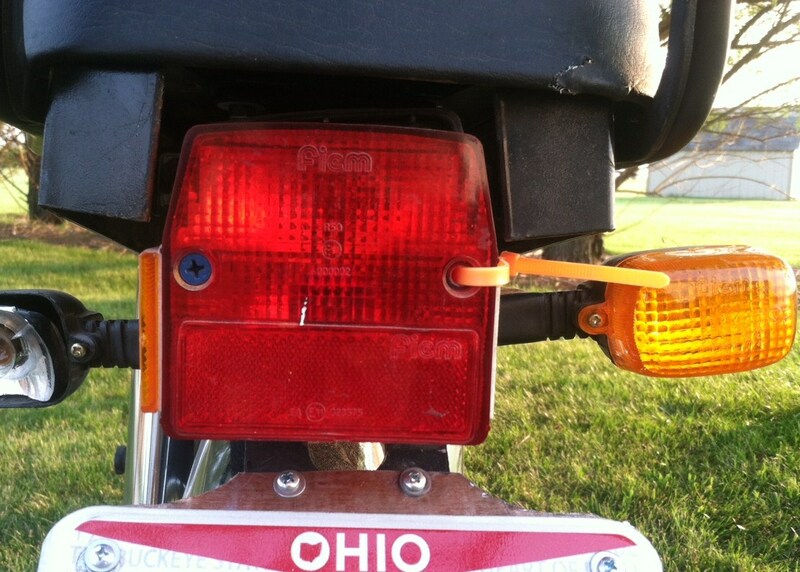 If the brake light burned out, the bike would loose spark when the brakes were applied. Internal ignition ground bikes did not use this lamp because it made the brake light too dim (because the 10 watt generator coil did not match the 20 watt bulb filament). 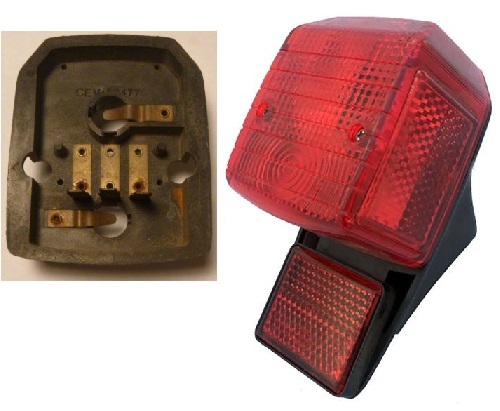 CEV 9400: In 1977 the 9400 “rectangular” series dual-bulb lamps came out, with two different bulb holders and three body styles. 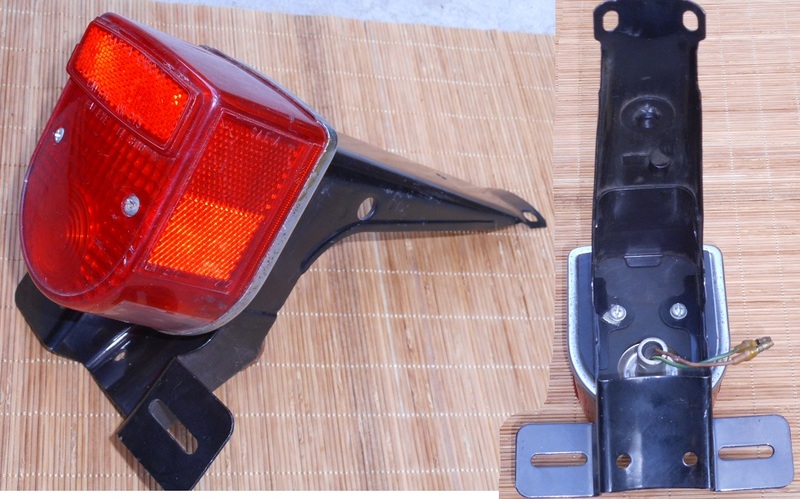 They could be for either family, internal or external, because the bulb holder could be either a “large glass” 18 or 21 watt brake light bulb, for external ignition ground types, or a “small glass” 10 watt brake light bulb version, for internal ignition ground types. At first the 9400,9401,9417 and 9400.1,9401.1,9417.1 were the versions. These were perfect for motorcycles with batteries. To solve the problem of loosing spark if the brake light burned out, CEV made versions special for USA mopeds, with a power resistor hidden inside. If the brake light burned out, the resistor would allow the engine to stay running. The 9400.2, 9401.2 and 9417.2 soon superseded the 9400.1, 9401.1, and 9417.1. So the “1” versions are uncommon in the US, and the “2” versions are uncommon in Europe. Of these, the 9400 and 9400.2 are common. The 9400.2 is on 1978-89 Derbi. Of these, only the 9401.2 is common. It is on 77-78 Garelli and others. Of these, 9417 and 9417.2 are common. The 9417.2 is on 1977-85 Tomos, and 1979-85 Garelli. The 9417 is on 1987-2011 Tomos, and 1978-86 Puch. 9400 and 9401 are solid mount, M6 stud and a plastic post. 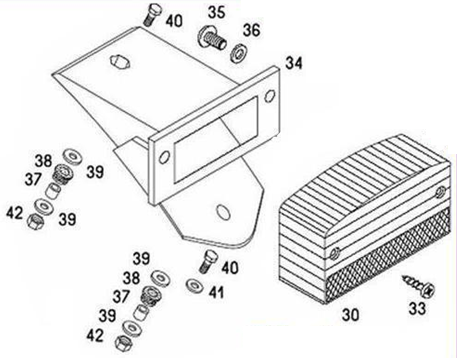 9417 is either solid or flexible mount, M6 stud and M6 bolt. This lamp looks exactly like the original CEV 9417 on the outside. But inside the bulb holder-mirror is different. It is a single bulb type that cannot be swapped for an original 2-bulb type. In the USA, in motorcycle parts stores, the single dual filament bulb has limited choices in volts and watts. There is just 12V 21/5W #1157 or 6V 21/5W #1154. There are LED substitutes for 1157. Some work with 6V AC, and some don’t. 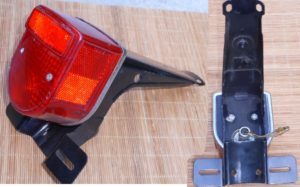 ULO made tail lights, reflectors, and turn signals for German mopeds, Hercules (Sachs), Kreidler, Solo, Kynast, and tail lights for many non-German mopeds, Batavus, Sparta, Puch, Peugeot, Motobecane and Honda PA50. ULO was founded by Moritz Ullman in 1947 in Geislingen Germany. 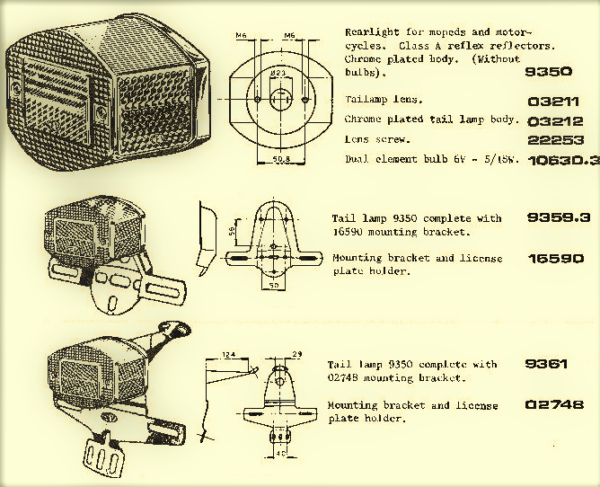 Ullman knew how to make molded glass products, like bicycle reflectors. ULO plastic parts have a date mark. The lens has the compliance standards and those have a start date. The little rubber grommets #72 for the two-bulb holder-mirror, are important. When one is missing, the bulb holder is loose. 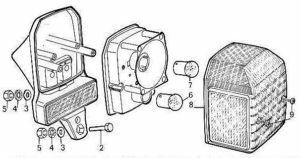 Engine vibration causes the loose holder to “buzz” or vibrate and rub against the lens and housing. The buzzing causes the bulbs to burn out, and produces white powder. The white plastic dust or powder is evidence of “buzzing”. These look the same on the outside. But the bulb holder is different, a metal plate with plastic bulb sockets that are loose. No rubber cushions/grommets and loose shaking bulb sockets will make the bulbs burn out frequently from vibration. besides that there is no upper mount hole or mount screw, but a hole can be drilled. 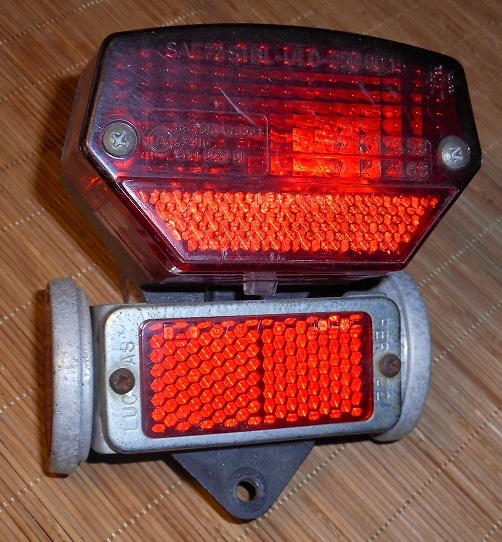 Peterson tail lights, made in Grandview, Missouri USA, were on ’76-80 Jawa and ’76-77 Derbi mopeds. 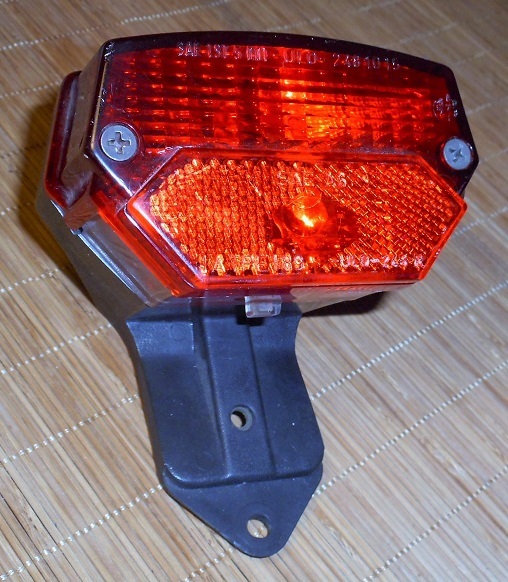 Peterson PM-421 meets 1970’s US safety standards for motorcycle tail lamps (shines to the sides). Also has built-in side reflectors, eliminating the need for separate ones. Used on 1978-80 Jawa, 1976-77 Derbi, and not many others. Dozens of different Stanley tail lights, made in Japan, are on most Honda motorcycles and mopeds. Here we focus on those used on mopeds and small motorcycles. Stanley 040-4765, used on 1977-85 General (top-tank), Lazer (top-tank) and compatibles, made in Taiwan. 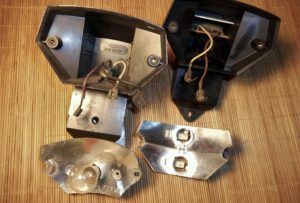 Stanley HM-23RC, used on 1977-83 Honda Express NC50 and Express II NA50, made in Japan. 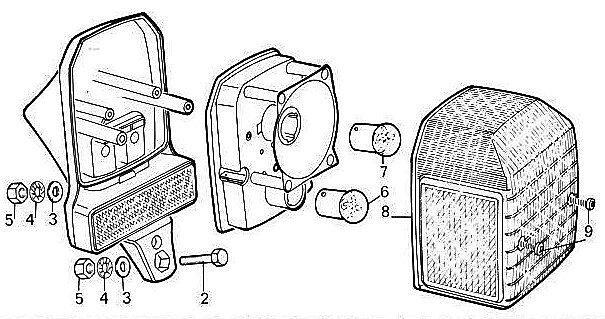 Stanley HM-42RC, used on 1984-85 Honda Spree NQ50, 1990 Honda NS50, and other late 1980’s Hondas. 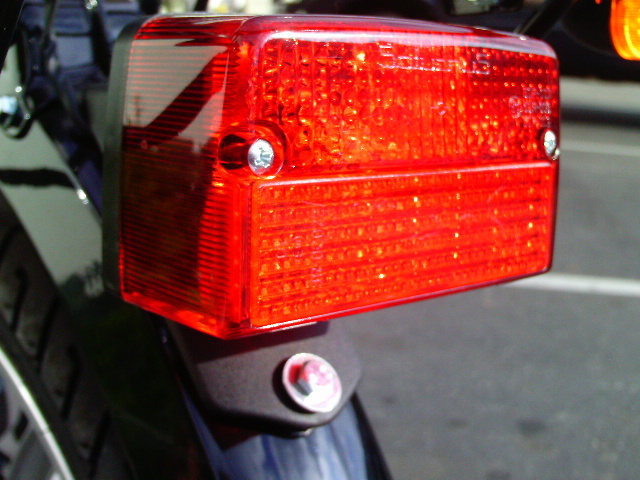 Cat Eye reflectors, lights, and turn signal kits, for bicycles and mopeds, were made in Japan. 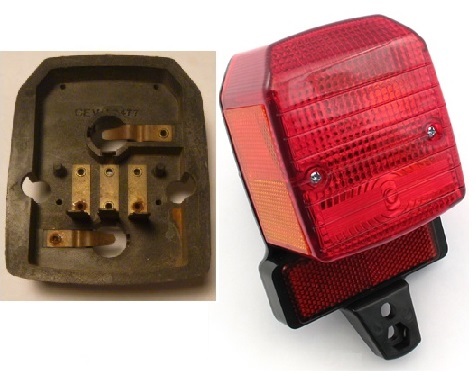 Cat Eye TL-800, used on 1977-85 Taiwan mopeds, Indian, Angel, General (step-thru) and compatibles. Saturnus tail, turn and head lights were made in Ljubljana, Slovenia. 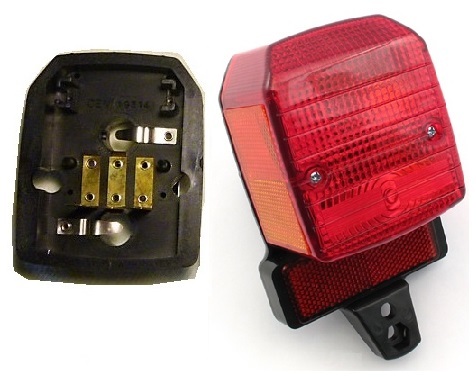 Saturnus tail lights were only on 2012-13 Tomos mopeds (US models), but they have been on European models for decades. 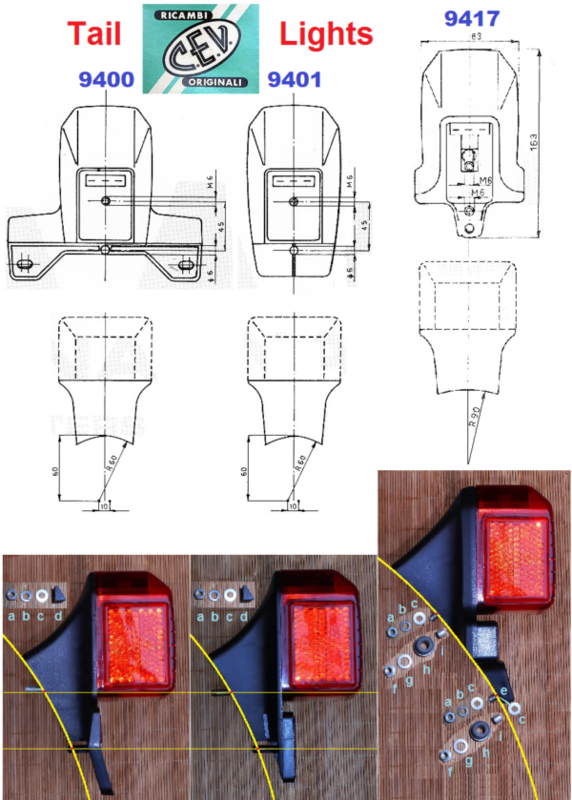 Saturnus 2-bulb tail lamp parts, from 2012 Tomos USA Parts Manual. 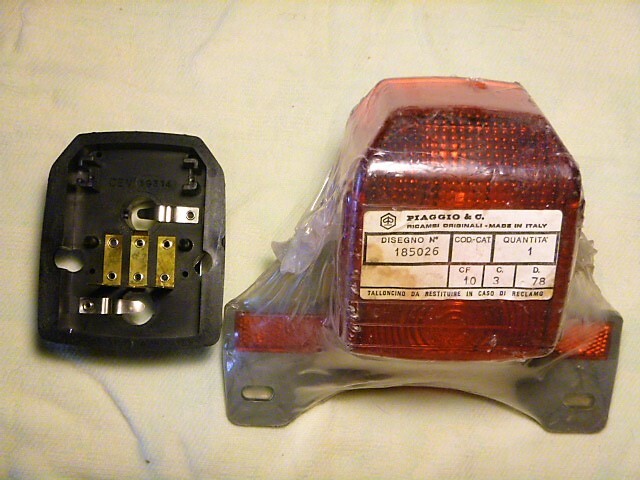 The fender mount was made to interchange with CEV 9417. The upper 6mm stud on CEV 9417 was very short. That made the special shoulder nut necessary, on 1978-2012 Tomos with CEV 9417. This Saturnus mount uses separate bolts, which are longer. That eliminates the need for a more costly shoulder nut. So Saturnus mount uses a 2mm shorter nut, 2mm longer bolt, 2mm longer spacer. This makes the bolts/nuts 2mm closer to the rear tire. 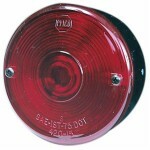 Fiem tail and turn lights are made in India. They are on 2000’s Hero, Pacer and Avanti mopeds. You are currently browsing the archives for the Tail Lights category.